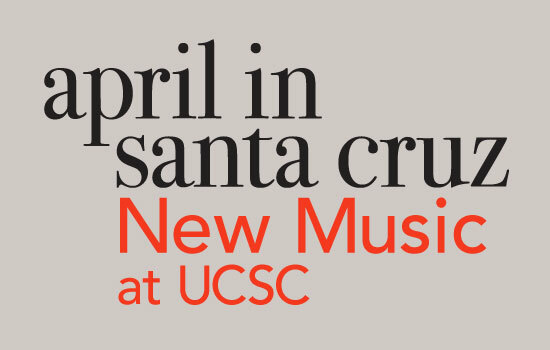 A series of seven concerts featuring new music by UCSC faculty composers and graduate students. See details below. April in Santa Cruz is a presentation of the UCSC Music Department, with thanks to Porter College (UCSC); UCSC Arts Division (Dean Susan Solt); Rahman Jamaal Mc, Executive Director at HIP HOP CONGRESS; Debra Watkins, President, California Alliance of African-American Educators Interdisciplinary Artists Aggregation, Inc.; Arts Research Initiative; and April in Santa Cruz. All concerts in the UCSC Recital Hall unless otherwise noted.